Hello all! 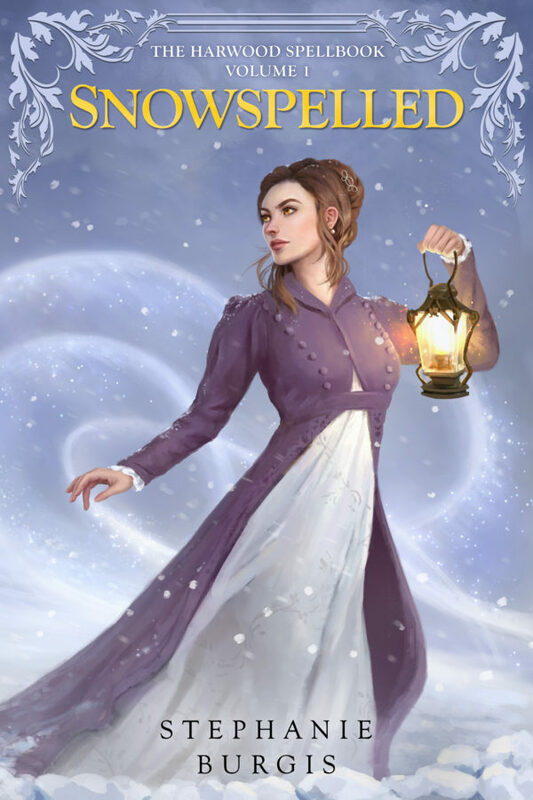 Today we are delighted to reveal the cover for Stephanie Burgis’ upcoming novella Snowspelled! 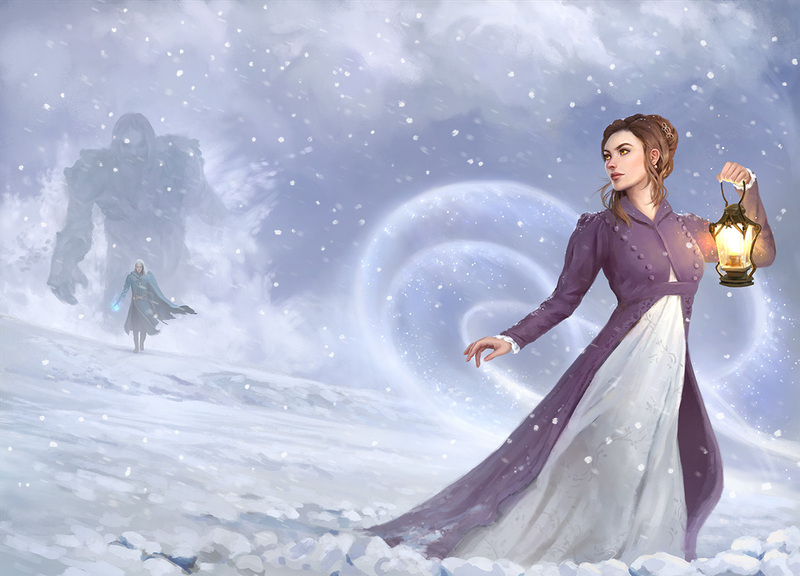 When I finished writing my novella Snowspelled, I knew one thing for sure: I wanted to commission original cover art for it – something I’ve never done before. Oh, my MG publishers have all commissioned wonderful fantasy artists to illustrate the covers of my MG fantasy novels, from Kat, Incorrigible to The Dragon with a Chocolate Heart. But when it came to the just-for-fun, shorter side-projects that I’ve put out myself over the years (including my first-ever novella, Courting Magic), I’ve always relied on cover designers who used stock photos to put together lovely, magical covers without any original art being required. This time, though, I wasn’t happy with that option. No matter how hard I looked through online libraries of stock photos, I couldn’t find any photos of models in Regency-era clothing who matched my vision of my powerful, strong-willed magician heroine. None of the models who looked just-about-right for her were even shown in any active poses – and Cassandra is someone who is always striding forward to take action in one way or another. But then the fantastic Ilona Andrews (author of many of my favorite romantic fantasy novels in the world!) recommended my novelette The Art of Deception to her readership; the sales went wild for one astonishing and memorable weekend; and by the end of that Sunday night, nigh-on-miraculously, I had enough money from the sales of that particular novelette to commission original cover art for Snowspelled after all. I can’t even describe how much fun it was to go hunting for fantasy artists! I got to immerse myself in so many different gorgeous galleries of art. When I came across Leesha Hannigan’s work, I knew I’d found exactly the right artist for my story. Not only did Leesha read the whole novella herself before coming up with her cover concept, but she was incredibly thoughtful, responsive and flexible in imagining all sorts of small and perfect added details for the cover based on the alternate-historical world of my story. When I saw her final cover art, I actually gasped out loud in delight and astonishment. There was my heroine on the cover! And she was in just exactly the right setting, with just exactly the right mood. There were no compromises involved whatsoever – and it was better than I’d ever imagined. And when I saw the final cover (with text and additional detailing by cover designer Patrick Samphire)…wow! A witty and sparkling romantic fantasy that opens a brand-new series from the author of Kat, Incorrigible, Masks and Shadows and Congress of Secrets. Volume I of The Harwood Spellbook. Beautiful cover. Can’t wait to read it, off to pre-order. I just started Dragon with a Chocolate Heart this past week. It’s a gorgeous cover! I just preordered the novella.